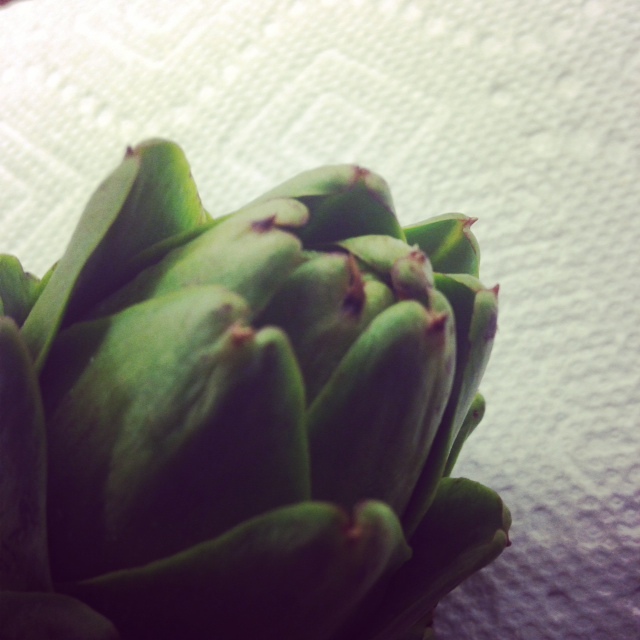 When I moved to California about 20 years ago I discovered artichokes. 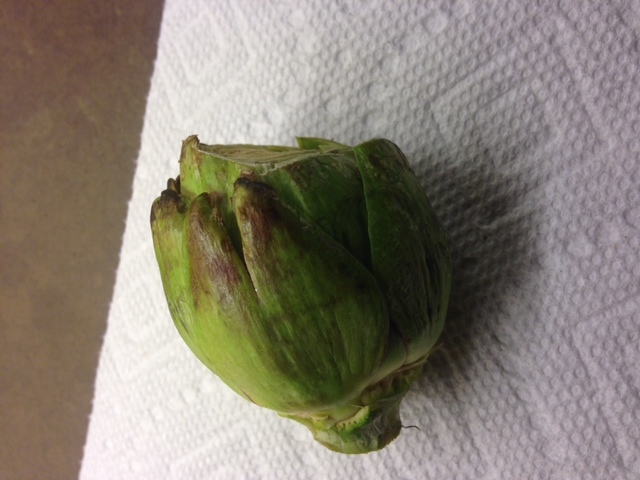 Growing up in Florida we did not eat many artichokes and by this I mean none. So the discovery of artichokes was somewhat of a revelation to me. Now I just plain and simply love and adore them. Last night I braised some baby artichokes in white wine and butter and tossed in some arugula and garlic to keep them company. Clean your artichokes. Don’t be scared, it’s easy. Just take some sharp scissors and cut off the top part of the choke where the prickly things are. Then peel off the outer leaves and trim the bottom. Next slice the artichoke in half and scoop out the choke which is the right at the bottom above the stem…it looks kind of shaggy. This is the bad part that you don’t want to eat. 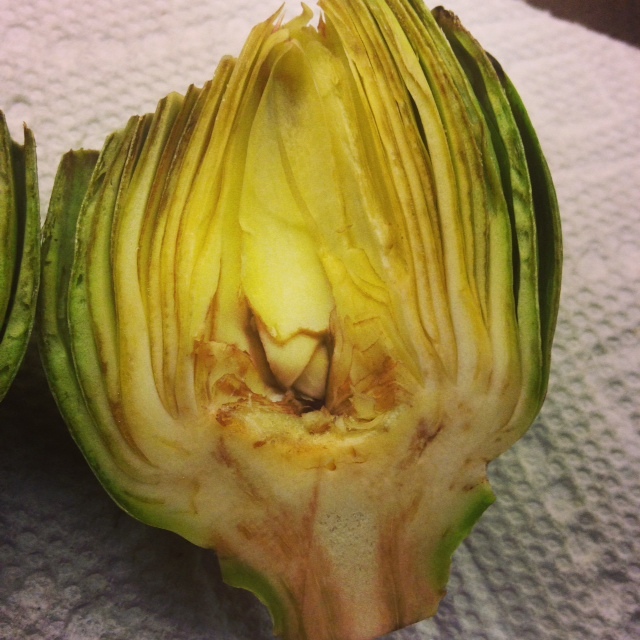 Baby artichokes only have a tiny amount of this part. Once they are all cleaned you are ready to braise. In a heavy sauce pot add some butter over medium to low heat. 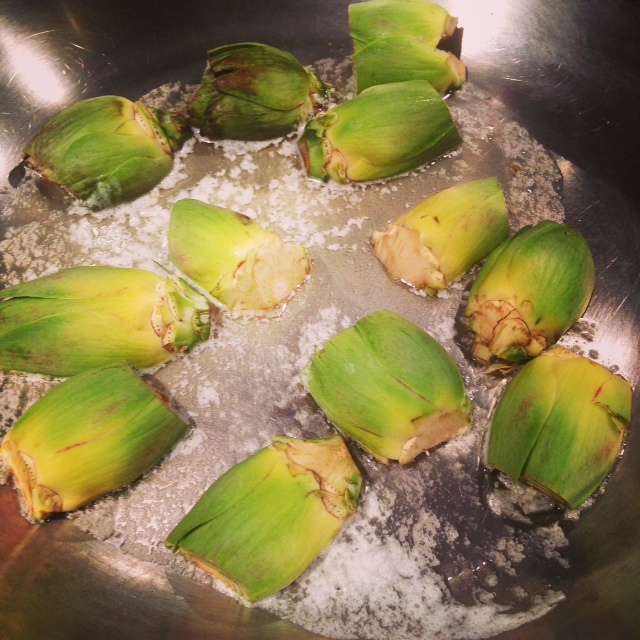 Then add your artichokes to the pan cut side down. Don’t stir them around. Just let them sit there for a few minutes getting nice and browned and then flip them over and brown the other side. While you are doing this step add some slivers of garlic to the pan. I added a lot of garlic-about 3 cloves sliced thin. 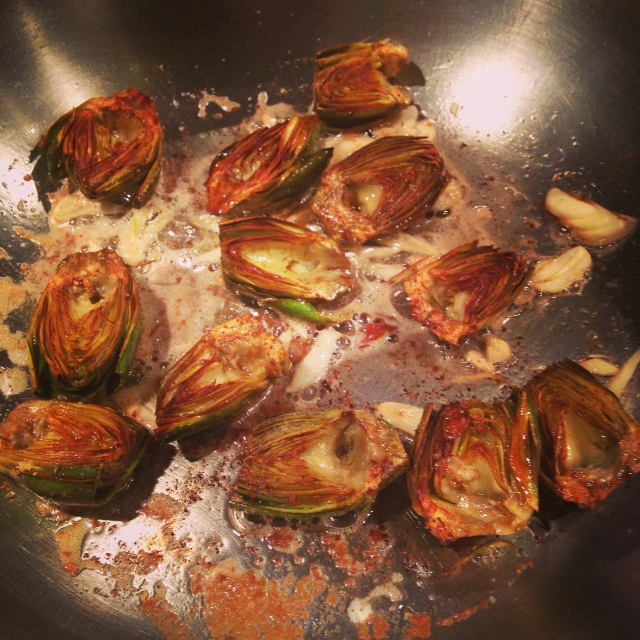 After the artichokes are nice and browned on both sides you are ready to deglaze the pan. So add about a cup of whatever wine you have. I used Chardonnay. I know. Shocking that I had Chardonnay on hand but hey whatever works for you. Once the wine cooks down quite a bit add your arugula or spinach or whatever greens you like. And then sauté that until it is wilted and the sauce is really thick almost like syrup. To finish just add Salt & Pepper. I served this as a side with braised chicken and mushrooms. But it is delicious on it’s on. Or tossed with pasta or faro or quinoa. Go crazy. It’s your kitchen. 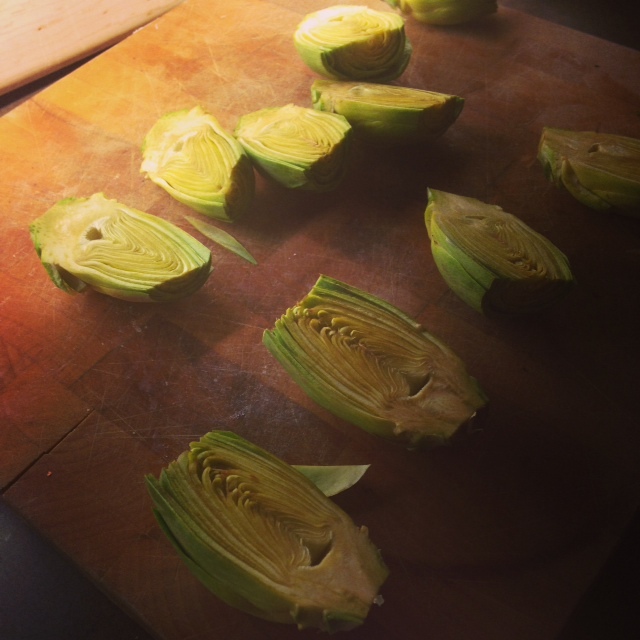 Clean artichokes and cut in half. Remove the choke. Add 2 TBS butter to a have sauté pan. 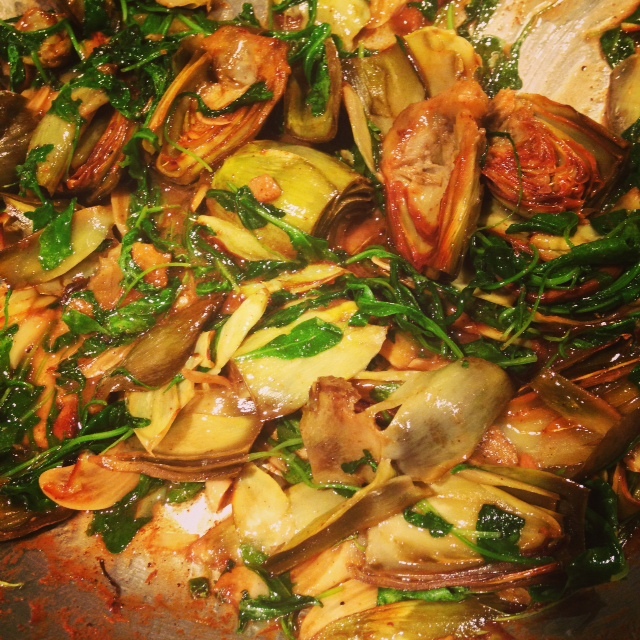 Place artichokes cut side down in the pan over medium low heat. Brown on 1st side and then flip. Add slivers of garlic to the pan. 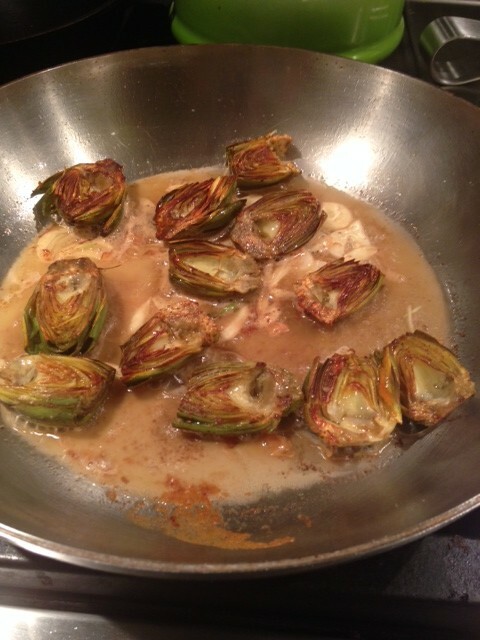 Once artichokes are browned on both sides add a cup of wine to the pan. Cook wine down by half. Add greens and finish cooking down until sauce is thick and the consistency of syrup. Season with S & P.